The navigation server NAVIGO allows you to view websites and emails from the workstations without them accessing to Internet. The navigation software "Firefox" and the email client "Thunderbird" run on the server NAVIGO, which sends to the workstation just the graphic screen of such applications. 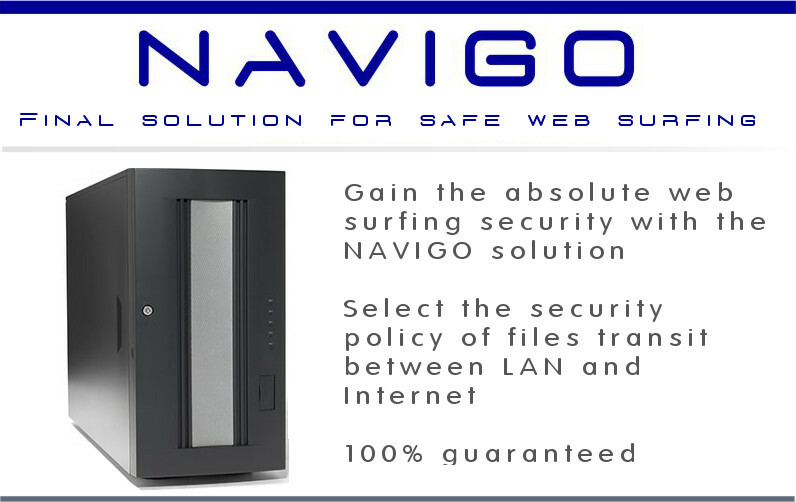 In this way, the workstations can not be infected by any malware or virus contained in the web pages or emails, as the applications are run on the server NAVIGO, that is configured to be really secure and hard to infect. In Navigo, each user has its own profile and workspace, separated and protected from the other workspaces. NAVIGO can also operate as a proxy server, so it can filter and trace the internet browsing. It's also possible to adjust the exchange of files between the local network and the Internet, without the need of distinct workstations and surfing stations. In addition, the centralized email and area management greatly simplifies the backup of the workspaces. Navigo is available in different configurations depending on the customer needs. Disk space, CPU, RAM, the number of network interfaces and other system specifications can be tuned according to the number of users and expected load. A powerful hardware configuration can handle up to 100 concurrent users. The installed software can be customized per customer needs, adding proprietary, commercial and open source software. The main requirement is that the software can be executed in Linux, in the details the feasibility will be determined case-by-case.